Introduces both the spoken and written language. Upon completion of this course, students should expect to be able to engage in simple conversations about everyday activities as well as to read and write the complete Korean syllabary. Proper pronunciation and the development of conversational proficiency are strongly emphasized. Grammatical topics include demonstratives, honorifics and the humble form, pronouns, interrogatives, negation, descriptive and action verbs, plural markers, irregular verbs, and conjunctions. After completing Level 2, students can expect to be able to make requests, ask for assistance and discuss their daily schedule of activities. Building upon the basic foundation provided in Level 1, topics include expressions of time and date, interrogatives, numbers, present and past formal tenses, the polite informal style, future tense markers, conjunctions and plural forms. Listening skills and proper pronunciation continue to be strongly emphasized. 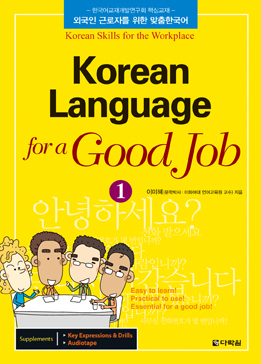 Over the past thirty years, we have reviewed many Korean textbooks and have selected Korean Language for a Good Job 1 (Darakwon Press) as the one that best fulfills the objectives of our students. Teachers provide suggestions for texts and supplementary materials at the higher levels. Books may be purchased online at Hanbooks.com. Tuition for the Korean program at all levels is $499. There is a non-refundable $35 registration fee for first-time students only.